Before moving to Herefordshire Jenni Stuart-Anderson worked as a freelance designer and lecturer at a London art college. 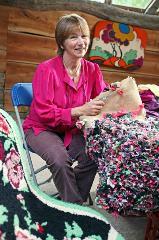 Since 1987 she has taught rag rug making in England and Wales passing on traditional techniques of Hooking, Progging and Plaiting (Braiding). In her work she combines techniques in traditional or contemporary designs for rugs, hangings and 3 dimensional works which she has exhibited widely. With work in private collections in America, Canada, France, Italy, Japan, New Zealand and UK she is happy to quote for making customised textile works. Jenni is a member of the Worcestershire Guild of Designer/Craftsmen and the Heritage Crafts Association. Her work can be seen at the Lion Gallery, Leominster; Blue-Ginger Gallery at Cradley; Made in the Marches, Kington; Timothy Hawkins Gallery, Hereford. Jenni uses recycled materials and locally sourced hand-spun yarns. Her book RAG RUG MAKING is out of print (after 4 reprints) and MORE RAG RUGS & Recycled Textile Projects was published in December 2011. Signed copies from Jenni.